A french manicure is something that gives the nails a sophisticated look, but something I can never be bothered to do. So when the Nailene French Manicure Pen Kit* dropped through my letterbox, I was pretty excited to try it. In the set, you get the classic nail guides, which I don't tend to use often anyway, so they are at the back of my drawer now. Then, we have the White French Tip Pen, designed to draw on the french tip. I prefer this for nail art designs, such as polka dots etc, just because it can be a little dry to colour in a whole tip. I do liek this though, just be careful that it doesn't dry up after the first use - I've been there. We then have the Hard and Healthy French Pink which I really dont know about. It is really thin and streaky, and you can't exactly rack up the coats when you are applying it over your perfected white tips, because they won't be so white anymore. Also, this chips/peels/flakes literally a matter of hours after you apply it - maybe I did something wrong? Moving on, we have the Acrylic Strong top coat, which is a really glossy top coat, which is the part I love. Now I am not sure whether this is what made the french pink flake around all over the place, but I don't think so. This set retails for £6.99 at Boots if you are interested, but it might not be for everyone. I do love a french mani, but the process bores me, especially when I am in a rush; sticking, painting, french tip drawing, top coating - maybe a bit lengthy. 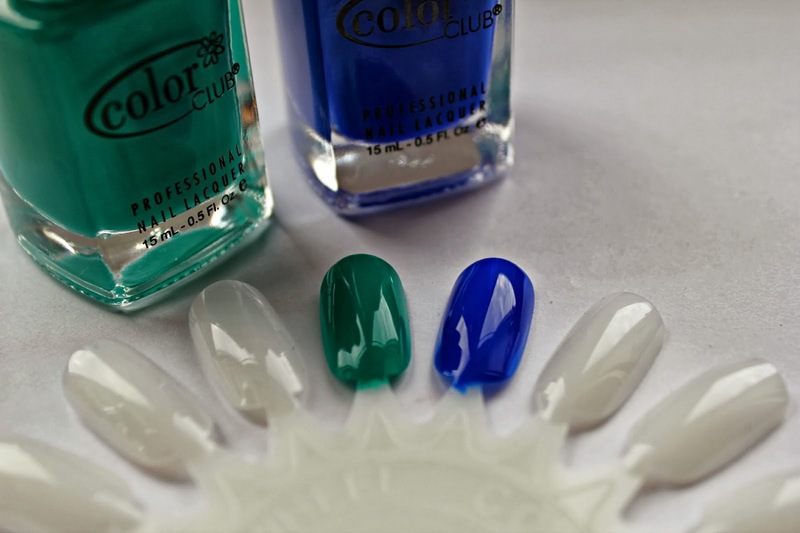 Color Club is a band that has great nail polish offerings, but we don't often see them on our shelves here in the UK. In the past, I have managed to find myself a pack of 4 from the Take Wing collection from TKMaxx, and that is what I have done again, except this time, it is 2 polishes, from the Kaleidoscope Summer 2013 collection, for £3.00. The colours stood out to me when I saw them in the shop, unlike anything I already have in my every growing collection of polishes. First in the collection is Abyss, what I have on my nails as I type this post. It is such a nice colour, a sea foam-turquoise hybrid. It is a lovely glossy finish, and pretty opaque too, 2 coats did it for me. I must say though, this is the thicker one of the two, which I wasn't sure about, but if you get a little more than you need on your brush, and you wont get any stodgy looking brush strokes. Aside from that, I am liking this a lot. Then, we have Bright Night, a bright cobalt, purpley blue, in a creme-jelly mix of formulation, which is my favourite of the two, and what I actually bought the mini set for. I have also worn this one, the day I got it I had put it on. I love this, and will be featuring in a future post about my picks for Autumn nails, because I can tell I will get a lot of wear out of it. One thing I could complain about this that these chip quite easily, like after a days worth of wear or less, but I do have problems with chipping on most nail polishes I wear, so I can't say that it is down to the formula. I really hope that Color Club polishes will be more readily available in the UK soon, as I really do like the colours they offer. We all have those heart stopping moments when you have forgotten a must have product in your handbag, and most of us will panic and buy a new lip balm, or sanitizer. 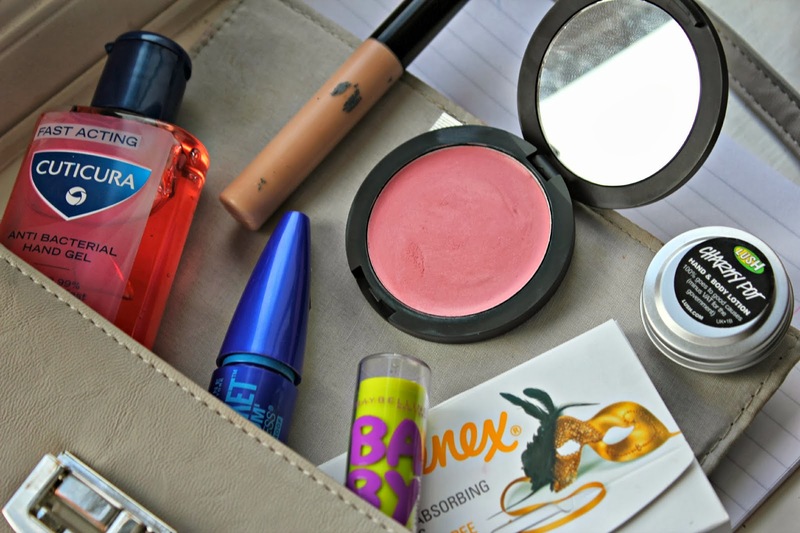 I have gathers my must haves, and put together a little handbag beauty edit in the hope that I won't be wasting money in the future. Hand gel. The number one product that will always be in my bag. Always. This particular one is the Cuticura Passion Flower and Mango offering, a big ol' bottle that smells good too. If you live in London, you will need this when commuting, and need to go on the dreaded, bacteria infested transport option which is The Tube. Blotting sheets are essential if you have oily or combination skin, or are just unlucky some days in the T-Zone. My favourite are the Kleenex Oil Absorbing Sheets, but they are tricky to track down, pretty much discontinued in my eyes. Anything to banish that shine will do. A mascara is a nice bolt-on to the essentials, for if you might be going out for dinner straight after work or a meeting, just whack on some of this to add some more oomph to those lashes after a day of business. My chosen lash oompher upper is Maybelline The Rocket Waterproof, as it doesn't really clump, so it is safe to layer. Throw in your lip product from the day, in this case it would be a Gosh Soft n Shine lip balm, and also a lip balm to banish the chapped lips you might be greeted with in the Winter. This one is the Maybelline Baby Lips in Mint Fresh, lovely. Equally, you blush might wear off a bit. Annoying huh? I always opt for a cream offering, for quick application, and in this case, it is the Dainty Doll Cream Blush in Paper Roses, very natural, very blendable. Hand cream. My hands basically have rocks falling out of them when they get dry in the winter, boulders even, so to keep them as full of moisture I can, I will carry a mini hand cream or two. My favourites are the OPI Avojuice Quenchers in Vanilla Snowflake, and the Lush Charity Pot - this one doesn't smell the best, but it does it's job well, and you donate to charity when you buy, even better. Finally, concealer. For hiding those pesky blemishes that may appear throughout the day, or if you are like me, and your makeup tends to slip and slide throughout the day when you get a little shiny and oily. My go to for camoflauging any obstacles - the Collection Lasting Perfection Concealer. 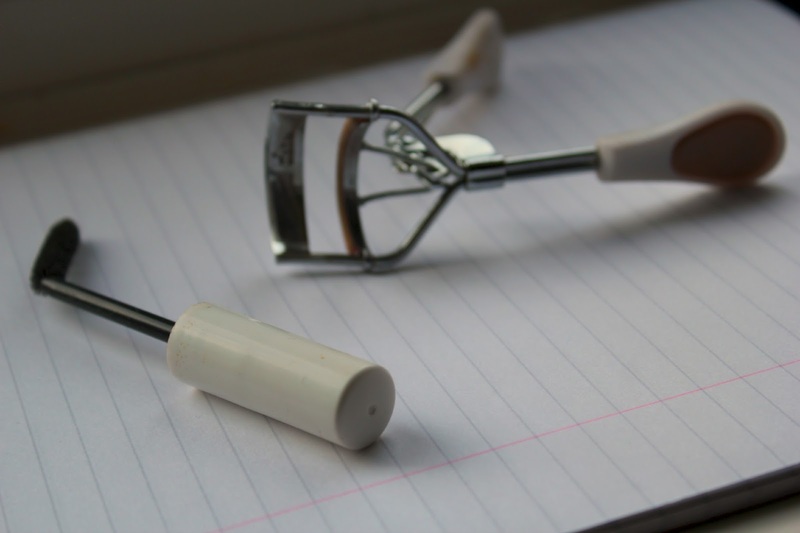 I'm sure every beauty blogger out there dreams of the Shu Uemura lash curlers, but our purses - not so much. In the same way, of course we all hope to get our mitts on a MAC Brow comb, but it's not realistic either. Although my options may not be equal in quality, they serve me well and I am going to share my thoughts anyway. If you want a brow comb, and you have finished/dislike a cheap mascara, give the wand a clean. This will be your new brow comb, without the price tag. The one I use is from a Natural Collection mascara, which wasn't the best, but it does a jolly old job of combing though those brows. In the same way, grab a cheap clear mascara and use it as a brow gel, instead of paying £15 for the same product with a brand name on it. Lash curlers. The torture device look-alike. Primark sell these ones for £1-£2 with a replacement of the rubber pad to make sure you don't cut those lashes off, not a finest moment to pin in the photo album. Although the pricier ones will no doubt work a bit better, for someone like myself on a budget , they serve me well, and should do until I have the money for new ones. You can even get No.7 or Models Own ones from the likes of Boots, for under a tenner, instead of the £20+ high end ones. I know most of us are probably brand snobs, but it doesn't hurt to make a few savings here and there, I know I do, and I feel pretty good about it. No-one likes an empty purse, with a 2p coin and a staggering receipt lingering at the bottom. If I see a mascara I want, I will be opting for the waterproof version whenever there is one. It isn't that I have oily lids or problems with smudging all that much, it is more like a security blanket for if I get a bit hot, or if I am caught out with the occasional frequent downpours we get. I have been trying out this triad for a few weeks now, and it has come to reviewing day. Maybelline The Rocket has been the second mascara I have tried from the brand, after finishing my Falsies one. This used to be my #1 mascara, but I have realised that there are better. For those clump free, fluttery, long lashes, this is one to go for, but for volume, this mascara lacks - and trust me, I have wiggled that brush through my lashes, layered it, the lot, I tried. It is a trustworthy waterproof though, if that's what you are after, and still isn't the worst of the ones I have tried in my time. An offering from Collection (previously known as Collection 2000), is the Skylash Mascara in Waterproof. This is one that you can also find in Poundland, as it has been rebranded numerous times - if you like this, stock up at these times. This one adds that bit of volume missing from The Rocket, and also adds some length. This can be a very 'wet' mascara when you first open it, so be sure you wipe away the excess before you look like you have applied it with a paintbrush. My current favourite from the clan is the CoverGirl Volume Exact Waterproof option. Now, I don't know what I am going to do when this runs out, because I found it in TkMaxx, so I am assuming it is discontinued, and we don't have the rest of the CoverGirl selection here in the UK. I am crossing my fingers and my toes that this appears in another TkMaxx somewhere, because I am starting to adore this one. The packaging is another story though, reminding me of something you may find buried at the bottom of you Nan's collection, but in the end it's whats inside that counts. Mascaras are one product I use every day, so my share of the latter is growing all the time. Just wait, in a few months time I will have a 'Take Two' of this post. Balms, Stains, Chubby Sticks, Crayons, whatever you want to call them - they are everywhere. I've tried my share, across 3 brands, and it would be rude not to compare them. They are all over a range of prices, starting at £3 up to £7.99, ticking everyone's boxes. Starting off, we have the Revlon Just Bitten Kissable Balm Stain in Honey - £7.99. My first ever balm stain product was this, and I fell in love with it - as demonstrated by the 'nub' stage I have on this one. This is the wearable option of them all, as these balm stains are meant to be long lasting, and 'stain' the lips, a quality we all desire in a bright. I wear this at least once a week, I am in love. Lasting power wise, this does stain, but isn't drying, and fades naturally so you don't have that dodgy-lip-liner-style pout. Second, we have the Rimmel Colour Rush in On Fire - £5.99. This is the most recent purchase of the chubby sticks. I am a little bit scared of red lips, but the cherry tone in this one is gorgeous. I have been wearing this lots on the weekends, I adore it for a bright. The texture and lasting power side of things, this is the closest I have gotten to a Revlon one, and they are £2 cheaper, not a major saving, but I will definitely be getting more. They smell nicer too, I used to be a fan of the Revlon scent...but now it has dawned on me that there is nicer. Finally, we have the MUA Power Pout in Justify - £3. I have another one of these, but they aren't my favourite. They don't stain like the Revlon or Rimmel, as they wear off a lot and are more like a lip balm. They are quite pigmented, but not so much as the others. They taste a bit funny too, like the Sleek Pout Polish I own, the vanilla is almost a bit plastic tasting. 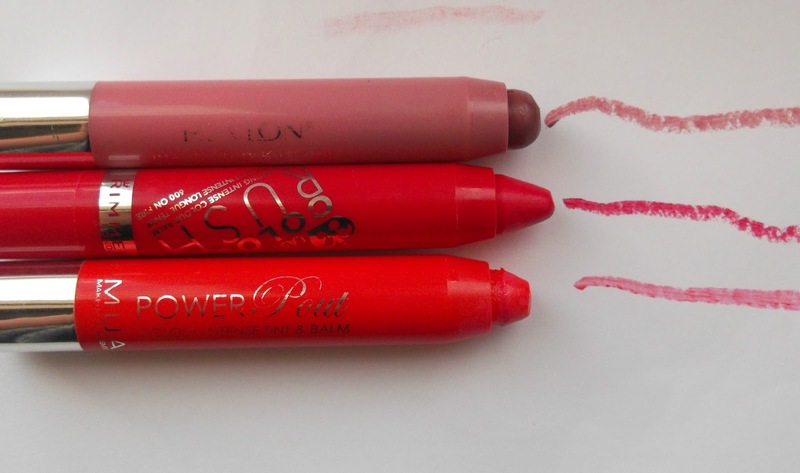 If you want something that isn't going to break the bank, the colour selection is nice too, then these are an option if you want to try out the (not so)new lip crayon trend. Lip crayons play a big part in my lip product collection, and they are the easiest thing to use when you want to be quick and long lasting. 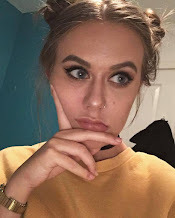 After writing this, I am very tempted to run to Boots and try some other brands, Bourjois, 17, and even the Clinique Chubby Sticks if I can fork out - or maybe I can divert to the eye crayons. I don't know about you, but when I wake up in the morning, after hitting the snooze button numerous times, I feel ver groggy, and I just need waking up. I gravitate toward the fruity, citrus scents to really get me ready and prepared for the day. I am aware that you can get cheap shower gels from just about anywhere, but I have found 2 that I really like, that are worth those extra pennies...or pounds. First of all, we have the LUSH Happy Hippy Shower Gel which is the more expensive option when you want this in larger quantities, starting at £3.50 for 100g. Strongly scented of grapefruit, this will well and truly wake up your senses to kick-start the day - like a fruity breakfast in a bottle. Don't use too much, it lathers well and, well, less is more - a much loved, and sometimes a little annoying, phrase used by us bloggers. Up next, we have the Body Shop Sweet Lemon Shower Gel - This one, is a little more affordable, at £4.00 for 250ml, the more for less policy. If you don't like lemon scents, don't get this. It is very much heavily scented with lemon, but sweetened that little bit, so there isn't any of this overpowering, headache causing stuff. Yet again another well-lathering one, which just makes you feel clean, literally for the whole day. I used to be such a bath person, but at the moment I just don't have time - So I try to make a shower as luxurious as it can get, by using some nice scrubs and gels.